Bomar ID: SD16-09, Riverside Cal. Columbia machine cancel. Message is war related. Sent to Holland, but undeliverable, and returned. Censored three times, once by the Dutch (number 29) and twice by the Germans (numbers 215 and 374) for both incoming to and departing from Holland, a neutral country. 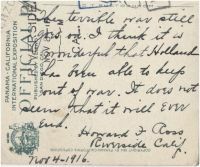 With no return address, the Riverside post office probably held it for Howard Ross, or found the carrier who serviced his residence who delivered back to him.